Keep an eye on baby all night long with automatic night vision. Built-in lullabies may help the parent comfort the baby fall into a sleep. Automatic night vision. Unobstructed Effective Range : 160ft/50m indoor, 850ft/260m outdoor line of sight. Night Vision Distance: Min.5m. 2.4GHz wireless digital technology,no interference, no privacy leak. Pixel: H: 640; V: 480. Night Vision Distance: 5m. 1 x Wireless Monitor. Built-in night light. Lullaby: make baby more fast & soft to go to bed. Features 1,Hassle-Free Portable Monitoring 2,Two way(talk back) 3,Temperature monitoring 4,Built-in lullabies in the camera 5,Automatic night vision 6,Secure, interference free, long range digital signal 7,High contrast 3.2″ color LCD monitor 8,Long battery life (18 hours in Vox mode) 9,Multiple languages support(English/French/Spanish/Portuguese/Italian/German/Russian) 10,Built-in lullabies may help the parent comfort the baby fall into asleep. 11,Know your baby\'s room temperature all the day long without worries! 12,Two way audio between the camera and monitor, you can talk back to baby. 13,Keep an eye on baby all night long with automatic night vision 14,No need to charge the battery for the monitor In the whole night in Vox mode. Baby monitors greatly improved the life of freedom and flexibility of the parents. With the help of this monitor, parents can be in another room or even outdoor without worrying their babies, this monitor is well aware of their kids. 5,Automatic night vision,night monitoring. 13,Keep an eye on baby all night long with automaticnight vision,night monitoring. 3,Unobstructed Effective Range: 160ft/50m indoor/850ft/260m outdoor, line of sight. 1 X V20 Digital Audio Baby Monitor. Install three AAA batteries for both baby and parent unit. With high sensitivity: you can know your baby easily even when you are in another room. Baby Unit Specification. This item is practical baby monitor holder. - 360 degree rotating, and flexible arms makes it easy to position the phone at the ideal distance and angle for convenient viewing. 1 x Bracket. - Large clip base for stable mounting without vibrations. Receiver: sound alarm and vibrate if child is out of set distance. Applicable Scope: Kids, cell phones, pets, old people, etc. A perfect safeguard for cell phones, wallets, children, pets, etc. Receiver: 1 x AAA battery(not included). Ultrasound frequency : 3MHz. - 1 x Fetal Doppler(without battery). - 1 x Line-in Cable. - 1 x English user's manual. Description: Support multiple users to watch, the remote end do not restrict network, more than one plus at the same time to watch live at ease *HD 720P taking photo and video recording are clearer and more fluid. Support hd web camera function, experience the world clear face to face. Supporting high-capacity storage, maximum support 64G,support 24-hour video recording. WiFi smart net camera,easy to achieve real-time remote viewing. Baby sound C Pocket Fetal Doppler is a hand-held fetal heart rate detecting device adopted Doppler theory. It displays fetal heart rate on digital LCD screen. With easy and convenient operation, it can be used in hospital and clinic for daily self-check by pregnant woman, realizing early monitoring and care for life. 1080p Amazon Cloud Storage Waterproof 6 IR LEDS Motion Detections ONVIF. ONVIF Support. Image Resolution 720P(1280 720), VGA(640 480). Dual Stream Yes. Wireless WIFI, 802.11 b/g/n. Lens 3.6 mm 75° Wide-Angle Lens. Transmission range: Outdoor 300m(Eye of Sight). Indoor use only. Effective Pixel: H:640,V:480. And the Child Unit should be always plugged in. Resolution(Pixel): 320 240(RGB). so keep the baby monitor away at least 5ft(1.5m) from these types of products, or turn them off if they appear to be causing interference. Feature: rotatable. 1PC Baby Monitor Phone Holder. Large base design, wider clamping mouth, more stable force, double screw locking. Anyway we will try our best to avoid this kind of thing. Due to the light and screen difference, the item's color may be slightly different from the pictures. 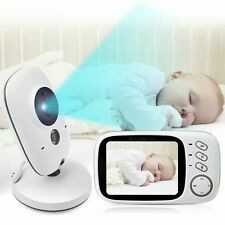 3.5" Digital Wireless Baby Monitor Video Audio Night Vision Camera 2 Way Talk. Multiple Lullaby Playback. 1 - Baby Unit. 1 - User Manual. -Multiple Language Support（English, French, Spanish, Portuguese, Italian, German, Turkey, Russian） -Unobstructed Effective Range: 160ft/50m indoor, 850ft/260m outdoor, line of sight. Night Vision Distance: Min.5m. Pixel: H: 640; V: 480. 2.4GHz wireless digital technology, no interference, no privacy leak. Night Vision Distance: 5m. 1 x Wireless Monitor. Built-in night light. 2 x Power Adapter(EU Plug). Specially designed for the baby, old people and nurse. Pixels: 2.0MP, 1080P. Support maximum 64GB TF card extension, fast data transmission and large data storage. PnP (plug-in and play) function, easy setup.